John’s Lumber is the #1 decking dealer in Macomb County! We currently stock 21 different colors of composite decking along with high-quality pressure treated and western red cedar decking and the stains to match. As the largest decking dealer in Macomb County, it only makes sense that we offer a wide variety of decking options. From cedar, to treated wood, to composite decking, we have a wide selection of options from several of the biggest brands, including Trex, Azek, and Timbertech. There’s nothing quite like summer time in Michigan, and having a beautiful deck only makes it that much better. Need help with designing or installing? We’re here to help, and will be every step of the way. 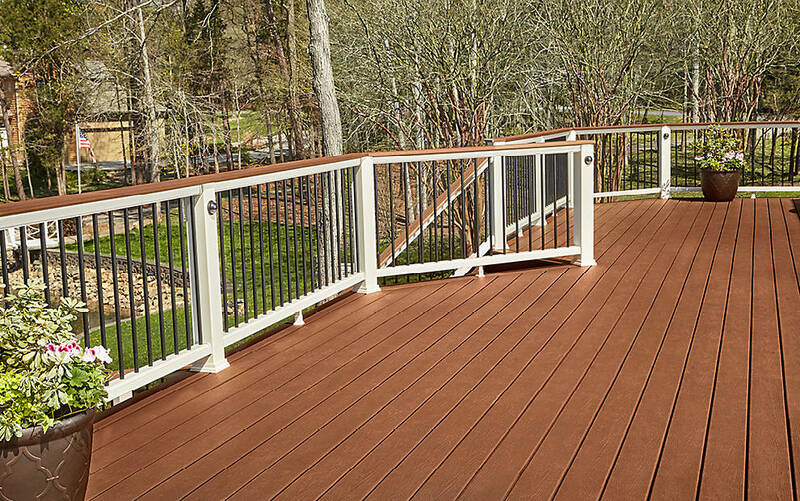 Today’s decks offer outdoor living in a fun, color rich, maintenance free way. Gone are the days of tiresome and expensive stripping and refinishing. Welcome to the world of hassle-free outdoor enjoyment. John’s Lumber offers a wide selection of decking products. We’ve done the work for you by selecting the best products we could find. Now comes the easy part. Finding one to fit your taste! Add some beauty to your backyard with a beautiful new wood or composite deck. At John’s Lumber, we offer a huge selection of decking options, from composite, to treated, and even cedar. with over 21 composite decking colors in stock, we are sure to have something for any taste, and if we don’t, we can get it. . There’s a reason we are the #1 decking dealer in Macomb County. No deck is complete without railing. That’s why at John’s Lumber, we offer railing options from Fairway, Trex, Azek, and Deckorators. With so many options available, the combinations are endless, letting you create the deck of your dreams, with beautiful railing to match. Our decking experts can help you choose the best railing for your deck, or even help you design a brand new deck from scratch. Not happy with the way your deck railing looks? We have railing systems that are easily installed on existing decks, with no hassle. There’s a reason we’re #1 in Macomb County, we make decking easy. 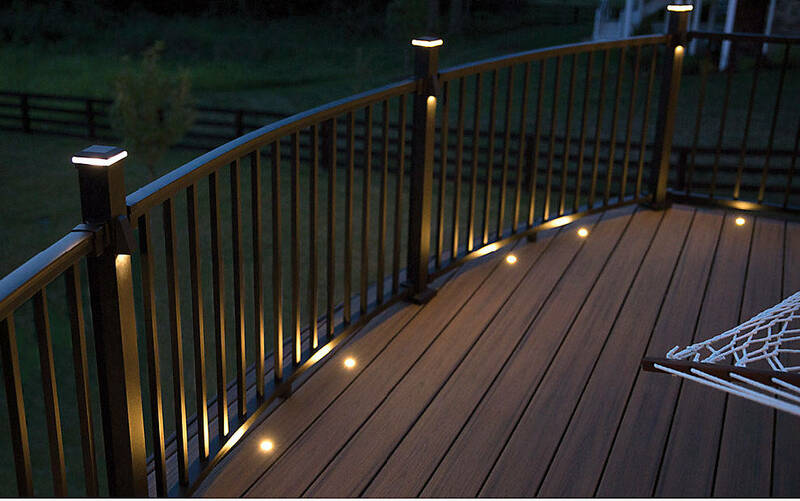 Lighting takes your deck to the next level, and allows you to enjoy your deck after dark. With a wide selection of lighting options available, from some of the best brands available, there is no shortage of beautiful options, from accent and post cap lighting, to riser and in-deck lighting to accentuate your deck railing. With lighting options from some of the best in the business, we are sure to have something for everyone, at prices for any budget, and our experts are here to help every step of the way. At John’s Lumber, we know decking, and deck lighting is no exception, let us help you make your deck as beautiful as it can be. Size: Just like an empty room in a house, it looks big with no furniture. Once you add a table, chairs, and a BBQ, it shrinks. Make sure it’s big enough to hold all the outdoor furniture you plan on putting on the deck, plus room for people. Optimizing material with a good design can grow your deck without a lot of extra cost. A 15′ wide deck can become a 16′ wide deck through good material usage and a few more deck boards. Levels and height: Avoid a step down at the door or door wall. This extends the living space of your home because the deck appears to be a continuation of the floor in the home. A one level deck makes furniture placement a breeze as every square foot can be used. Extra levels need to be big enough to be useful. Too small a space will go unused. Stair placement: Stairs to the yard need to be placed where they create a good flow to the backyard space. Walking down steps running to the left when the yard is to the right just adds distance. Placing stairways inside of the deck rectangle can eliminate problem placement. Good design is a must. Consider landscaping requirements when placing stairs. Exposure/shade: Decks built on the West side of a home can create a warm space in the early evening. Consider planting shade trees that will grow to shade the space in the late afternoon. With other exposures, determine when sun will be on the deck surface and plan accordingly. With a little forethought and a little time, trees can offer free shade while looking beautiful and they are great for the environment. Skirting: Lattice is the typical skirting material when you’d like grass right up to the deck. Lattice is also great for keeping most animals from getting under the deck. It doesn’t end with lattice. There are many beautiful ways to skirt a deck. Consider a removable or hinged door to allow storage of a few items under the deck if the height allows. Depending on the height of the deck, landscaping the area surrounding the deck adds beauty. Hostas or some other low maintenance plants can compliment the look.